First made at the beginning of the 20th century by Swiss nutritionist Bircher-Brenner, this breakfast favourite should contain only natural ingredients. The basic recipe contains sugar, but you can adjust this, along with all the other ingredients, to suit your own taste. To make the muesli, simply mix all the ingredients together. Store the mixture in an airtight container. Soak the muesli overnight for a softer texture. To 100g of muesli, add 150ml milk or fruit juice. Stir well and keep covered in the fridge. Add a dollop of Greek yoghurt or some single cream to the soaked muesli. Sweeten the muesli with honey or vanilla sugar. For something more unusual, try serving the soaked muesli warm. Place it in a pan and stir over a medium heat for 1 minute, or warm it up in the microwave for 30 seconds on high power. 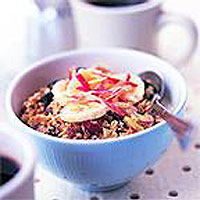 Stir fresh fruit into muesli, or pile it on top. Grated apple and chopped banana work well, or you can add frozen berries to the mixture the night before. Use fresh berries when they are in season.